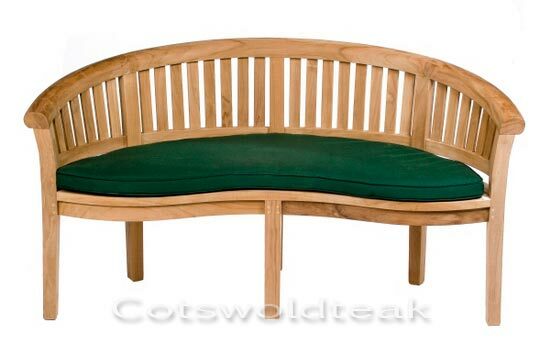 The Banana Bench, also known as the Crescent Bench or Peanut Bench, is a beautiful curved bench that has an 8cm scrolled top, flat seat and slatted back. The Banana bench is 160cm wide and sits 3 people. The Banana bench is of a sturdy heavyweight construction. The classic modern bench looks very elegant anywhere in the garden. The Banana Bench and matching coffee table will look at home in both modern and contemporary garden settings. A cushion to fit this bench is available in Green or Blue. See our Banana Bench Cushions page for further details. Quality features include mortice and tenon frame, seat and back, plus glued and pegged joints. Please note that all our benches are solidly built and must not be confused with inferior flat packed versions. This Banana Bench and matching coffee table are manufactured in our factory and are delivered to you fully assembled, (as shown above), which ensures quality, stability and longevity. 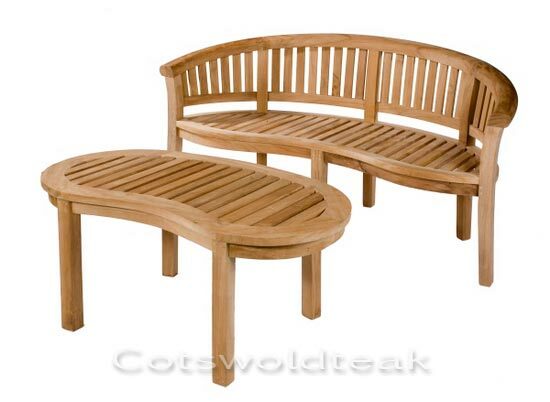 Teak is one of the most durable and attractive hardwoods used for garden furniture and regular treatment is not essential. If left alone Teak naturally weathers to an ashy silver colour which darkens slightly each year, however if you would like it to maintain a Honey Brown colour we recommend using Teak Protector. Click the button below to add the Banana Bench with matching Coffee Table to your wish list.